Topic: Is the EU Going to Topple? Re: Is the EU Going to Topple? The Poles don't want to have to be 'inclusive' of their 'slims, particularly on Christian holidays, so they've eliminated the problem population. Merkel...that hairy-legged progeny of Stasi thugs! The Poles, Czechs, Hungarians...they've had their fill of EuroTards, Muzzies and Socialists! They are our natural ally, the rest can go screw themselves! And that spawn of Stasi filth is threatening the Poles with Article 7 for refusing to take in the rampaging murderous scum of Mohammad! 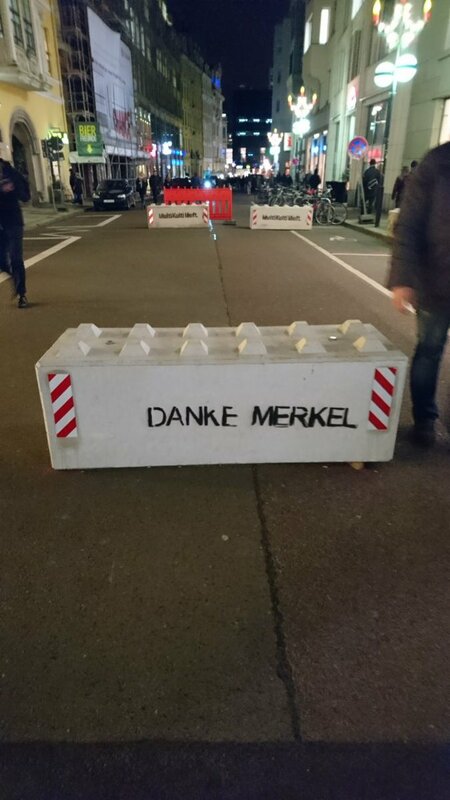 Germany is an empty shell...tell them to go ficken themselves! Twas the week before Christmas and not a barrier in sight. Come to think of it, no Muslims in sight, either. Ok, now yer jist braggin'. Bragging would be mentioning that it was about 65 degrees during our stroll through Christmasland. I'd say he has a duty to brag...especially about the lack of barriers and Satanic cultists! ...but the vile offspring of Stasi filth remains as Chancellor. Pick on America all you want...but at least we only try to sanction our foreign enemies! But hey, if we can pick up on this scheme I think Trump could have a sh*tload of fun! And, why not?! From what I got from the Italians is that they were better off without the EU the population is not happy. I would say that is a wise position, Brussels treats its member citizens as serfs, but there is a price to be paid for independence and not everybody will want to help share in the duty. ...alas, once the Swiss capitulated on their bank secrecy more "accomodations" would follow. Ironic that tax revolts against carbon taxes erupting in France. But they are #1 in taxes, and what should be cautionary tale for others...I am sure will be ignored by fellow socialist/statist travelers when votes on tax hikes come along. Darth Macron approval is cratering. Yellow vests demanding more, as I predicted in the G20 thread. Talks of overthrowing the socialist/statist state warm my heart...but like the last one in 1789...the outcome may not be desirable. But, if it helps topple the EU beast my only concern is who has control of the nukes. Statists still not taking them serious...will need to step it up. Prendre d'assaut tous les châteaux! Last summer, some protests broke out after revelations that Macron installed a swimming pool in the building, costing around $40,000 to the taxpayers. The president justified the pool, claiming he and his wife don’t want to be pictured by the photographers on the beach, the Sun reported. He say that to people being crushed by taxes. He loves his people...that's all that matters, eh? My fav quote from that movie. "Sir, the peasants are revolting!" "You said it. They stink on ice. "